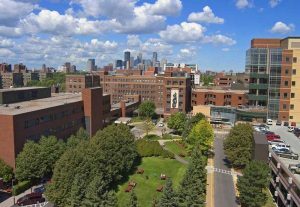 The Internal Medicine Residency Program at Abbott Northwestern Hospital, an urban quaternary care facility located in Minneapolis, Minnesota, has distinctly established itself as a leader in internal medicine ultrasound training with its ultrasound-guided bedside procedure team (founded in 2006), Center for Clinical Simulation (founded in 2007), and Internal Medicine Bedside Ultrasound (IMBUS) Program (founded in 2010). Under the direction of Dr. David Tierney, MD, FACP, these programs have flourished by embracing the mission of training all residents and faculty to confidently incorporate point-of-care ultrasonography (POCUS) into standard medical practice. 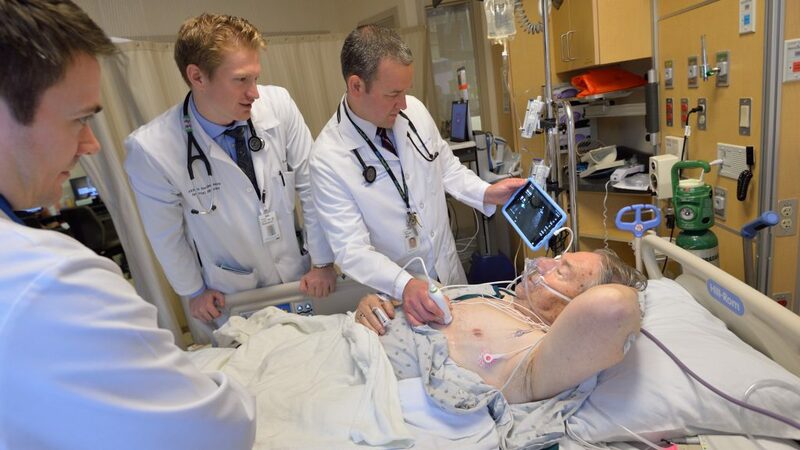 “When correctly integrated into the physician’s bedside acumen,” states Dr. Tierney, “bedside ultrasonography improves the time to diagnosis, reduces resources and cost, and improves patient satisfaction.” However, while the benefits of bedside ultrasound are evident, significant challenges are still met as far as mastering the new specialized skill and executing its integration into clinical practice. In order to overcome these barriers, the IMBUS Program at Abbott Northwestern trains its residents in bedside ultrasound through a rigorous three-year longitudinal curriculum that includes routine didactic and hands-on instruction, required inpatient and outpatient ultrasound rotations, and bi-weekly ultrasound-integrated code simulation sessions. 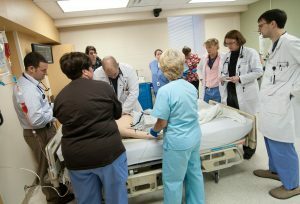 In December of 2015, the Abbott Northwestern IMBUS Program began to incorporate SonoSim LiveScan® into their code simulations. With SonoSim LiveScan®, SonoSim® Tags are placed in designated anatomic locations on a manikin or live human volunteer. The Tags can then be scanned with a SonoSim® Probe to showcase a variety of pathological conditions in real-time, which allows teams to run full mock codes without ever breaking the simulation. Dr. Tierney notes, “the change to using SonoSim with Tags on the manikin allows the team to learn the mechanics, image recognition, and the integration of findings in a code scenario, and removes the need for an artificial ‘pause’ to obtain ultrasound information.” The program’s current format and simulation setup has been overwhelming effective: the IMBUS Program has been overwhelmingly effective, and is an important contributor to resuscitation outcomes well above national benchmarks at Abbott Northwestern Hospital. At the patient’s bedside, Abbott Northwestern’s ultrasound-guided bedside procedure team provides another level of ultrasound integration that ultimately reduces complications and radiation-based imaging while improving efficiency and patient satisfaction. As Dr. Tierney affirms, “The ultrasound-guided bedside procedure team provides a completely ultrasound-guided procedural service to all of our inpatients, allowing patients to remain in their room and have a procedure performed with the same safety as it would be in interventional radiology, at a significantly lower cost.” Furthermore, the ultrasound procedure team serves as a POCUS consultant for other specialties that may not be fully trained in this skillset. These accomplishments speak to the success of the internal medicine program both in its ability to thoroughly teach residents and staff, and apply those teachings at the bedside. When Abbott Northwestern’s internal medicine residents graduate, they typically pursue fellowships, hospitalist medicine, or outpatient primary-care. Because matriculating residents have a strong foundation in bedside ultrasound training, they are more confident at the bedside and more competitive when applying for positions. 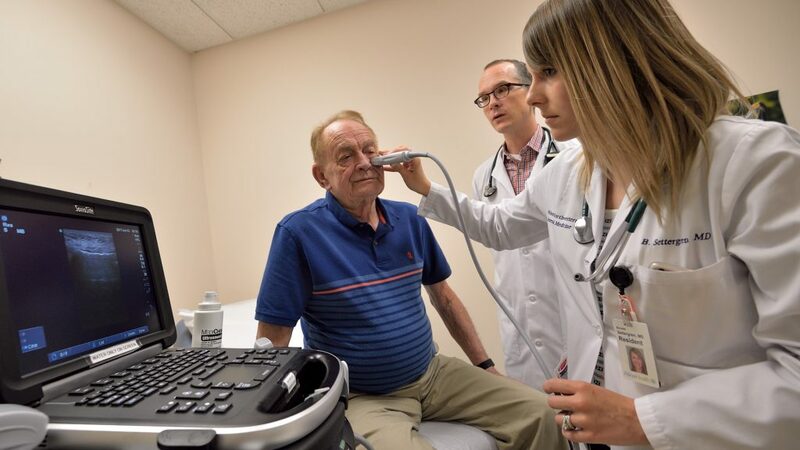 The Abbott Northwestern IMBUS Program helps physicians embrace the importance of ultrasound and exemplifies how to incorporate the valuable skill into their practice for streamlining patient care. Ultimately, this empowers physicians and their patients with a better understanding of their conditions and treatments.